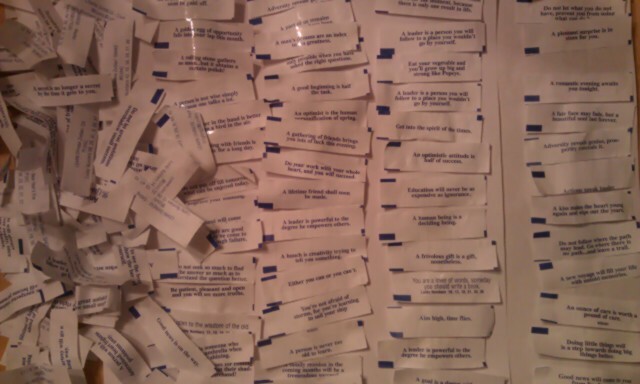 Click picture to see past fortunes. Sixty nine days, one hour, and forty-three minutes have lapsed – not that I was counting – since I published the fifth (if you’re tracking these oriental journeys using Roman numerals that would be a big-V) installment of the FCC. I will ask you all to understand this was NOT a nearly 70-day cookie fast. I have personally consumed many golden cookies containing pale slips of parchment with azure lettering upon them. BUT – That time has not yet come… Maybe later this week. For now, though, the time has come for me to post the contents of the current cookies consumed. 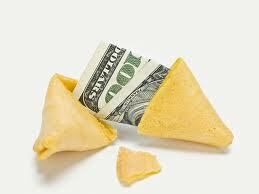 An unexpected check or fortune will arrive today. Since I ate this around 8 PM, I will allow a full 24 hours for fruition. A light heart carries you through all the hard times. Is this Buddha’s way of telling me the last fortune was a joke? A real friend asks to spend time with you, not money. 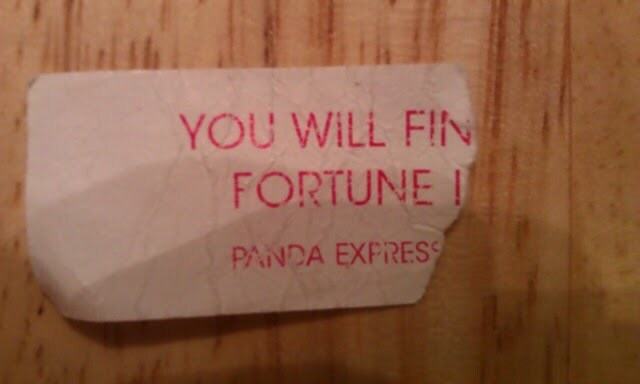 Okay… So is the fortune coming my way or not!?!?!?!?!? AND – what if the friend asks to spend time with you in a really expensive restaurant? Be on the alert for new opportunities. A kind word warms for three winters. Sure… be vague now… Oh!!! – I meant to say, Thank You!!!! The Giddy family’s first supper of March – brought to you by my friends at China House. 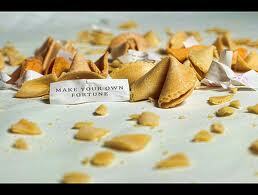 March 1, 2012: Crispy Golden Cookie – Contains Wisdom Carved on Pale Paper. Don’t expect to find one right way to make yourself more creative. Financial hardship in your life is coming to an end! Be magnanimous, be trustful, be hopeful and be patient. Giddy cannot withstand the Nurse’s will! February 18, 2012: Crispy Golden Cookie – Contains Wisdom Carved on Pale Paper. You will enjoy doing something different this weekend. Your respect for others will be your ticket to success. Your judgment is a little off at this time. Rely on friends. You would be wise not to seek too much from others, at this time. (This too was the little one’s… I think Buddha may be bi-polar? Listen these next few days to your friends to get answers you seek. You will soon embark on a business venture. This statue wasn’t there last month when I went, or any time prior to that. I thought it is a very beautiful and intricately carved piece of art. The jade is so smooth and I was very interested in the marbling of it – nearly solid white head, nearly solid green feet. The detail on the cabbage leaves is pretty amazing – you can see pores on the leaves. Actually, that’s not an ancient Chinese proverb – but no doubt it holds some truth. I did some Google-ing this evening trying to decipher what this statue means to these folks. Anyhow – it’s an interesting looking statue, full of symbolism… Just about every piece of that thing is a symbol for wealth, happiness, and prosperity. I don’t know what each of the words say – but the last one is wealth. 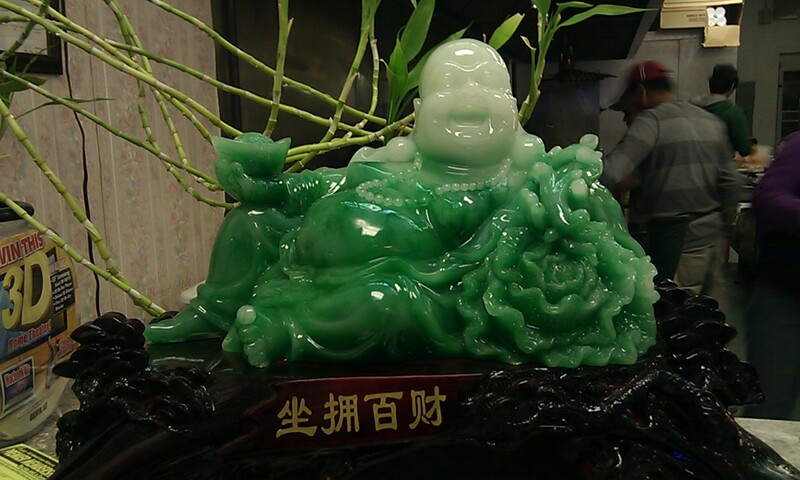 I know this also: Tonight, it was not this green Buddha that made them wealthy – It was me! Aw, yes – craving the Panda! Your courage will guide your future. Your hard work is about to pay off. You will be happily surprised by a long time friend. Crack (or click) me open and ancient wisdom you will find. Spaghetti was on the menu – but the Panda’s prevailed!!! After over 30 days without hearing from my Far-Eastern friends, I indulged in not one, but TWO fortune cookies! Tank-yu valy mush for vizting – kwik wink pho mo: Fortune Cookie Chronicles.